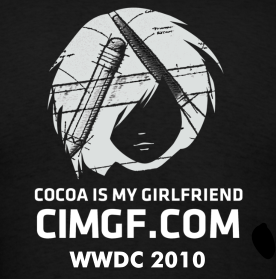 In celebration of the late notice of WWDC this year; CIMGF is offering late notice on our T-shirts! In previous years I took orders and then delivered them to you at WWDC. I discovered something from that it. It was a huge pita for everyone involved. Therefore, this year I am going to do it differently. I have created a storefront on SpreadShirt where you can order one of several different T-shirts (and a jacket) for this year’s WWDC. The new shirts include the new CIMGF logo which will soon adorn this beloved site. I hope to see many of you wearing the T-Shirts this year in San Francisco! I’ve never had a shirt from SpreadShirt. If I get the American Apparel shirt in a color other than black will the back image really have a black square around it? I locked down the shirts to black only because of the black background. I would not recommend changing the shirt color.